A common formatting problem with the ellipsis is that in some fonts it crowds too close to the following word. The intention is to have the same space between the dots of the ellipsis as between the ellipsis and the next word. An ellipsis is created in Word by typing three periods consecutively. Word will then auto-correct those three individual periods into a single ellipsis character, which looks very similar to three dots but maybe more or less spaced out depending on the font. a long dash (—) used in punctuation. 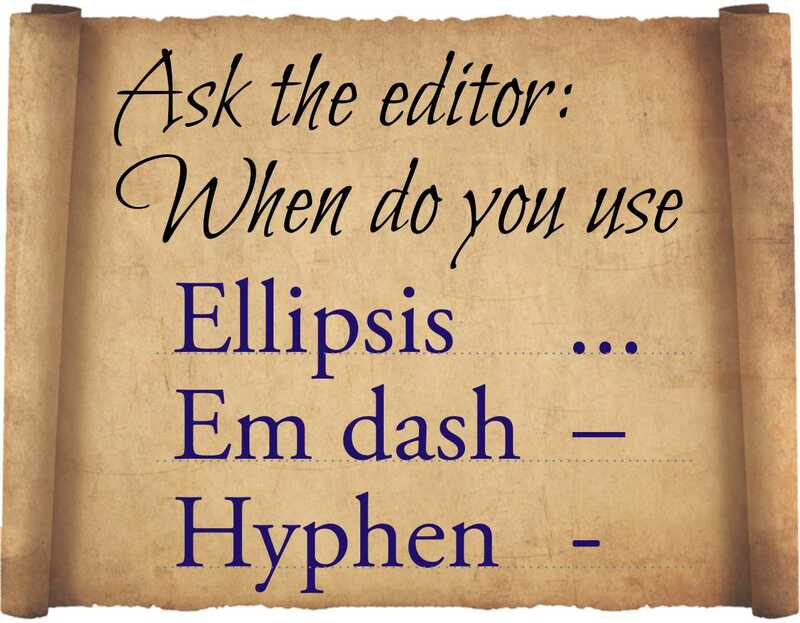 Distinguishing between when to use an em-dash versus an ellipsis or hyphen can get tricky. For one, they appear to serve and achieve the same grammatical purpose – a break. See what I did there? If I were to use an ellipsis, you’d pause while hanging on the word ‘purpose’ because you’re internally taking a break before reading the rest of the sentence, reaching the part where you finally learn what that grammatical purpose is. The em-dash emphasizes a phrase or expression to create an interruption in the middle of a sentence that contains two closely related points that do not syntactically fit – the em-dash is indicative of this dispersed or interrupted speech. Em-dashes allow you to veer off in a different but relevant direction, then return to the initial sentence purpose. The em-dash allows you to temporarily break off, then get back on track. Create an em-dash in Word by typing Ctrl+Alt+Minus (Option+Shift+Minus on a Mac). the sign -, used to join words to indicate that they have a combined meaning or that they are linked in the grammar of a sentence (as in a pick-me-up, rock-forming minerals ), to indicate the division of a word at the end of a line, or to indicate a missing element (as in short- and long-term ). Hyphens are complicated. Merely because two words seem to operate fine without them, even though they grammatically need it. Other times, two words do truly operate fine without a hyphen, though the author tends to stick one in there anyway. For instance, the phrase ‘in progress’ is one of the most common phrases in which writers attempt to throw in a hyphen, making it ‘in-progress.’ This is not necessary, for one simple reason: hyphens cement two words together. Not all terms need to be glued together, like ‘in progress.’ The gluing of these two words indicates to the reader that they are linked. Sometimes, hyphens are also used to provide clarity. First and foremost, there should never be a space before and after the use of a hyphen. Second, hyphens are physically shorter than em dashes. This list demonstrates three separate uses of hyphens. State-of-the-art and mother-in-law and Editor-in-chief demonstrate the “closely linked” words you describe. Dog-friendly, factory-made, and 10-minute demonstrate the use of a descriptive phrase, where the second word is an adjective, and the first word is an adverb modifying the adjective. This format is almost always used before the noun. After the noun, there is no hyphen. For example, “a factory-made tool,” but “the tool was factory made.” If the hotel is dog friendly, it is a dog-friendly hotel. See? Hyphens aren’t so intimidating. In fact, hyphens can emphasize your words and help the reader see the association between two functions. The hyphen can serve to connect two words, and also separate syllables of a single word or phrase. When used properly, hyphens accentuate your sentences and, shall we say it, look aesthetically appealing! It is important to note, however, that hyphens should not be confused with em dashes (which is a longer line than the hyphen). I believe that “well formed” should not be hyphenated unless it is a predefined whole term as in a legal document. What would be the need to hyphenate it otherwise? The words are a noun and an intentionally unspecific modifier. To me, with use of the hyphen, it would indicate a whole unit with its own clearly understood meaning between writer and reader. Hi Holly! Thank you for your response. Hyphens are a complex beast, and depending upon the country you live and write in, the case for proper hyphenation varies. In the United States, compound words are hyphenated when preceding a noun or adjective. In this case, ‘well-formed’ precedes the term ‘sentence,’ which serves as a noun. In order to properly demonstrate the combined meaning of well formed, since it directly refers to a sentence that is well constructed, these two words must be hyphenated. Notice how well formed and well constructed were not hyphenated in the previous sentence? That’s because neither come before a noun or adjective, making a hyphen unnecessary. In the case of a ‘well-formed sentence,’ the hyphen establishes the connection between ‘well’ and ‘formed,’ since the two terms need each other in order to properly demonstrate that the sentence is indeed a well-formed grammatical construction. Kind regards, DRP. Why do some people use a double hyphen? Is there such a thing in grammar and punctuation or are they just trying to create an em dash? That’s an excellent question, Lee. Thanks for posing it. All the Dragon Realm Press editors are in agreement on this one. There’s never any time that you should be using a double hyphen. Some people may do so in an attempt to create an em-dash. In some applications, like Scrivener for example, when you type a double hyphen, both hyphens are converted on the spot to an em-dash. It could be that getting into the habit of using a double-hyphen to create an em-dash in this way may lead people to believe that’s how it’s done elsewhere, when that might not necessarily be the case. No, and yes they are substituting “–” or “—” for “—” (or, even more incorrectly, “–” as for “–” instead of “—”). 1) These characters are not hard-coded, as with their own keys, on standard keyboards. 1b) Even if they were, it’s been popular for a good while to not have a full 104+Numpad keyboard (or, more recently, no physical keyboard at all). 2) These characters are often well-concealed within word-processing applications. And many institutions, such as K-12, have grossly neglected instruction on such subjects. Most do not have occasion to learn their proper utilization—of the word processing applications too—until or unless they’re in college, where such things become mandatory; or woe! I actually attended an online high school for grades 11 and 12, and even there they didn’t cover the proper use (as regards formatting) of Word/OpenOffice! 2b) That’s assuming the program in question even has such a resource at all. A fair few do not. 3) Not everybody is familiar with coding, which is how you’d otherwise generate these characters (ALT+Numpad). 3b) Not everybody knows what the character’s name is, to search for it to copy+paste. I’m not in the least ashamed to admit that I was well out of school before figuring this out. A lot of luck involved in running into it. I’m also not ashamed to admit that I still keep a document—ode to cheat sheet—to copy+paste them, and other symbols, from (simpler than trying to remember the ALT+Numpad codes. Not to mention, much faster than, say for example, going over to Insert>Symbols>More Symbols>Special Characters in Word. Whew! ).